After playing during the Texas A&M and Eastern Michigan games in relief of Jack Milas, Neal was given the starting job in week four of the Cardinals’ season against Northwestern in late September. There have been flashes of greatness at quarterback, albeit with signs of inexperience. But that's to be expected of a freshman starting in such an important position. Coming into the season, head coach Pete Lembo was confident in Neal's ability, but was unsure how early he would take the reigns. Neal has thrown the ball 119 times for 72 completions, resulting in a completion percentage above 60 percent. The 6-foot-5, 217-pounder has also run the ball 46 times for 217 yards, one of which was a 41-yard scamper against Eastern Michigan for his only rushing touchdown. Neal is going through the trials of collegiate athletics, but he’s working through it. In Ball State’s 24-10 loss to No. 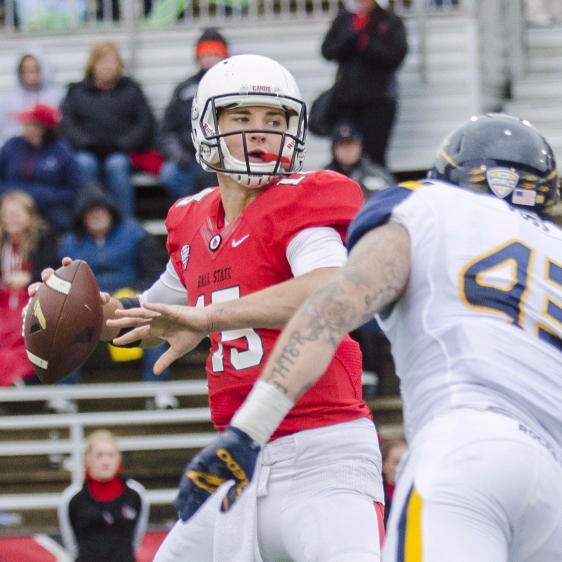 24 Toledo on Homecoming, Neal was 23-37 for 237 yards and a touchdown. It doesn’t show in the stats, but he missed some passes in the first half to open receivers that found separation. During a fourth-quarter comeback attempt, Neal was unable to hit a wide-open Dylan Curry in the end zone. This would have made it a one-score game. Toledo's defensive front harassed the freshman, forcing him to throw early and hitting him in and out of pocket. Neal hadn't felt that pressure in his previous contests. Lembo praised Neal's patience after the Homecoming loss, understanding that he is still learning. Another key aspect of his game is that Neal isn't turning the ball over through the air. He has zero interceptions, but has coughed up the ball twice on the ground during zone read runs. Neal will look to lead Ball State to a win in its next game, a road matchup against a tough Northern Illinois squad despite a 2-3 record.